Valentino Rossi holds a slender 11-point lead over Jorge Lorenzo as the MotoGP™ paddock heads to the Shell Malaysian Motorcycle Grand Prix. 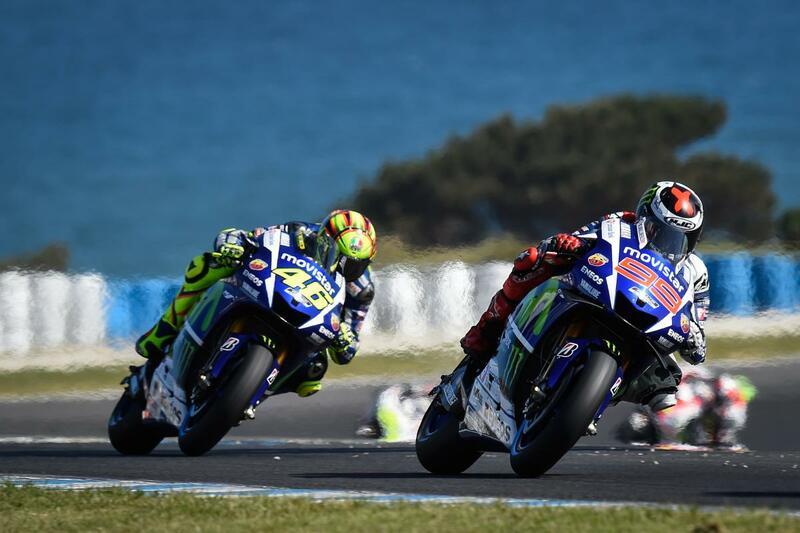 The Australian GP will go down as one of the most spectacular races in the history of the World Championships. Marquez took his 50th GP victory after an amazing last lap; Lorenzo reduced Rossi’s advantage in the standings by 7 while Andrea Iannone returned to the podium. If that wasn’t enough there were also 52 overtakes between the four during the race in what was an incredible display of riding. So with the #TheIslandBattle done and dusted, its time for the riders and teams to do it all again as they head to the final flyaway round at the Sepang International Circuit in Malaysia for round 17 of the 2015 MotoGP™ World Championship. Sepang hosted its first Malaysian GP in 1999 and has been ever present on the calendar since, with this being the 17th consecutive GP event the circuit has held. Last year’s Malaysian GP saw Marc Marquez take victory ahead of Rossi, with Lorenzo completing the podium. The same result in 2015 would see Rossi take a 15-point lead into the final round at Valencia. There is also a chance that Rossi could be crowned World Champion at Sepang if he can score 15 points more than Lorenzo. This would happen if Rossi won and Lorenzo was sixth or lower, or if Rossi came second and Lorenzo finished outside the top ten. Rossi could also afford to finish third if Lorenzo failed to finish in the top 14. Rossi’s record at Sepang is superb. The Italian has won six times in the premier class at the track but his last came back in 2010, although Rossi knows that he can still afford to finish second to Lorenzo in the last two races and lift his tenth title. Lorenzo has not been off the podium at Sepang in the last four races he has started, but hasn’t won there since his 250cc victory in 2006. Lorenzo will be hoping he can taste victory in Malaysia for the first time in his MotoGP™ career, as he attempts to pile as much pressure on Rossi in the final two rounds. Repsol Honda’s Marquez victory at Sepang last year was his first since his 125cc win in 2010. The Spaniard was second at the track in his rookie season and will be buoyed by his 50th GP victory at Phillip Island, plus he will fancy his chances for the win as Honda have been victorious in the last three races at the circuit. Marquez’s teammate Dani Pedrosa won back-to-back races at Sepang in 2012 and 2013, but crashed twice during last year’s race and was forced to retire. His first came while battling for the lead with Lorenzo in the early stages and then the second time after he had fought his way back from last to 11th. The Spaniard will also have one eye on the battle for fifth in the championship standings as he now enjoys a 7-point lead over Bradley Smith in sixth. Ducati Team’s Iannone has not scored a point at Sepang in the premier class after missing last year’s race through injury and being forced to retire in 2013. The Italian has stood on the podium at the track before though, in the 2010 Moto2™ race when he was third. Iannone now has a 23-point lead over Pedrosa in the standings, as he looks to secure fourth in the last two races. His teammate Dovizioso crossed the line in 13th at Phillip Island, his worst result of the season. He will hope to bounce back at Sepang where last year he finished in 8th, but he has stood on the podium in the premier class twice at the circuit before in 2008 (2nd) and 2010 (3rd). Team Suzuki Ecstar’s Maverick Viñales equalled the best result of his rookie MotoGP™ season with sixth at the Australian GP. Last year he was victorious in the Moto2™ race at Sepang and he also won the 125cc race in 2011. His teammate Aleix Espargaro crashed out of last year’s race after contact with Alvaro Bautista and his best result at the circuit in the premier class is eighth back in 2012. Monster Yamaha Tech 3’s Bradley Smith (158pts) holds an insurmountable 51-point lead over LCR Honda’s Cal Crutchlow (107pts) in the battle of the Satellite riders with only two races left. Octo Pramac Racing’s Danilo Petrucci (97pts) is a further ten points back from Crutchlow, but one point ahead of Smith’s teammate Pol Espargaro (96pts). Smith crossed the line in fifth in last year’s race ahead of Espargaro in sixth, while Crutchlow and Petrucci were forced to retire. In the Open class it is Avintia Racing’s Hector Barbera (30pts) who still leads the way with a two-point advantage over Forward Racing’s Loris Baz (28pts), after both riders failed to score points at Phillip Island. LCR Honda’s Jack Miller (17pts) has moved up to to third, one point ahead of Aspar MotoGP Team’s Nicky Hayden (16pts) after crossed the line in fifteenth at his home grand prix in Australia to take the Open victory. The Shell Malaysian Motorcycle Grand Prix kicks off officially with the Press Conference on Thursday at 17:00 local time, while the on-track actions starts with Free Practice for all three classes at 9am local time on Friday. Click here for the full schedule.